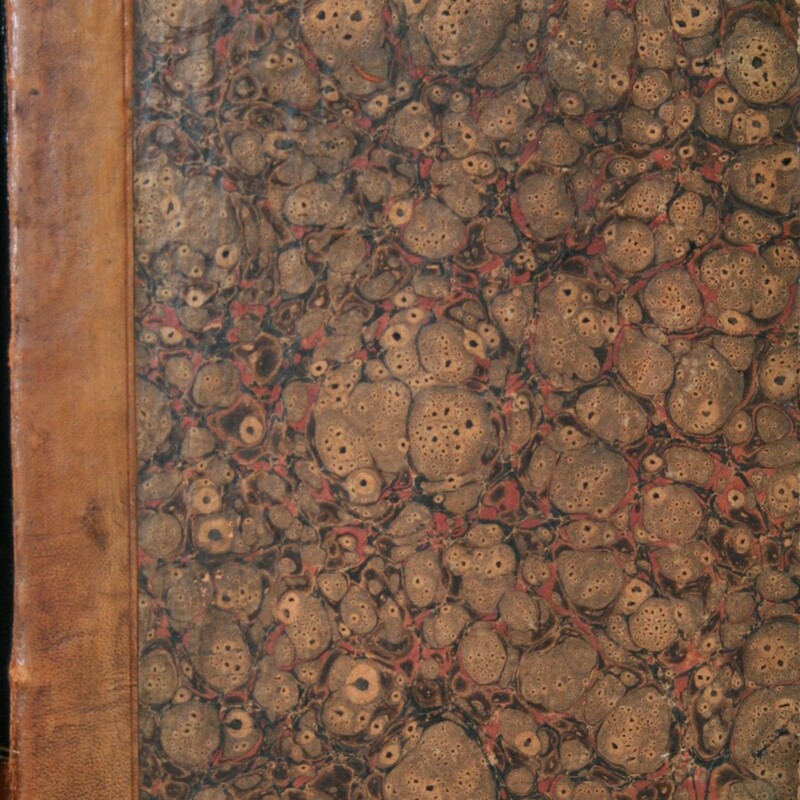 Home > Rare Books > Quintus Serenus Sammonicus: Liber medicinalis. Quintus Serenus Sammonicus: Liber medicinalis. Qvinti Sereni Medicinae Liber. Prohoemivm. Aratus: Phaenomena (translated by Rufius Festus Avienus). 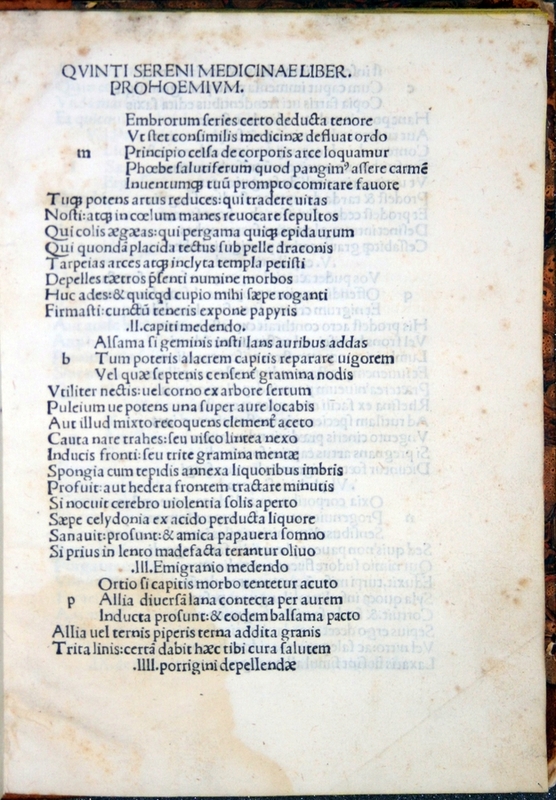 Add: Dionysius Periegetes: De situ orbis (translated by Avienus). Avienus: Ora maritima. Aratus: Phaenomena (translated by Julius Caesar Germanicus, with commentary). Aratus: Phaenomena (translated by Marcus Tullius Cicero). Quintus Serenus Sammonicus: Liber medicinalis. Edited by Victor Pisanus. 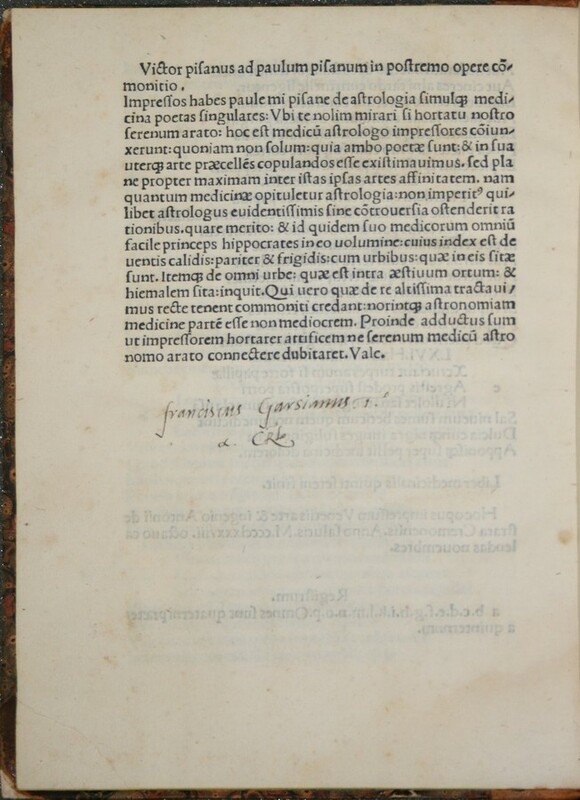 Provenance: Franciscus Garsianus (16th century): inscription in a humanist hand on p6v “Franciscus Garsianus” followed by abbreviations “.I.” (Iurisperitus) “et C.R.L.” (Canonicus Regularis Lateranensis). 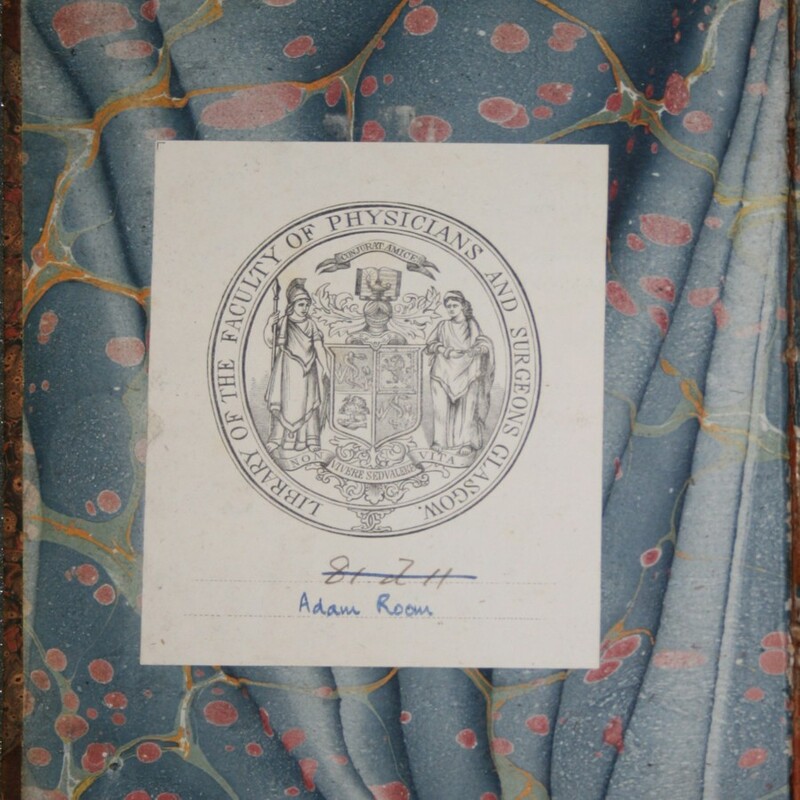 Royal College of Physicians & Surgeons, Glasgow: armorial bookplate on front pastedown “Library of the Faculty of Physicians and Surgeons Glasgow” bearing superseded shelfmark in ink “81 d 11” (scored through); a later armorial bookplate of the College on recto of front free endpaper; probably purchased by the College in 1811/1812, since the Faculty minutes for 2 Dec. 1811 show that the Library was granted £80 in addition to its usual budget, for purchasing “a selection of books of the older medical authors” and the minutes for 8 Oct. 1812 note that “a very valuable addition has been made amounting to nearly two hundred and fifty volumes bought in the course of the year with the funds granted by a vote of the Faculty”; source unknown; first appears in 'Catalogue of books in the library of the Faculty of Physicians and Surgeons of Glasgow' (Glasgow: 1817). 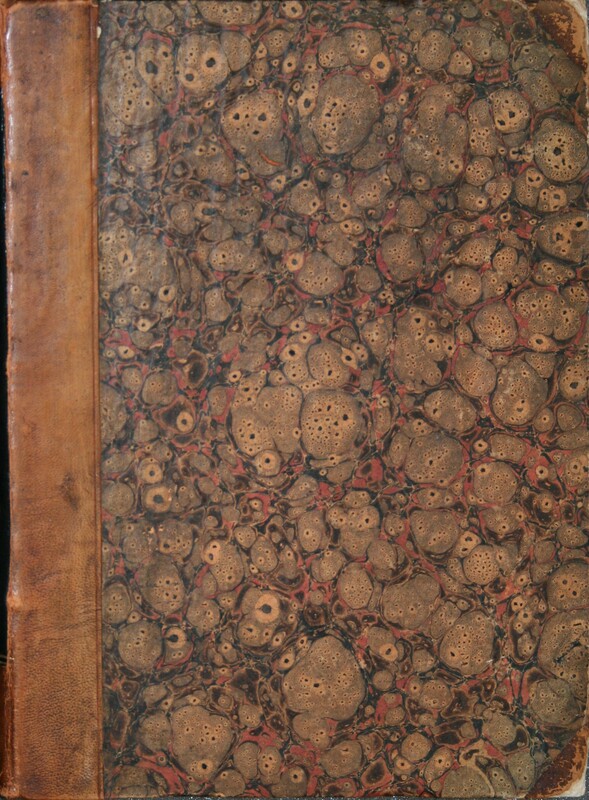 Binding: 19th-century half calf, marbled paper-covered boards; marbled endpapers; yellow-edged leaves. 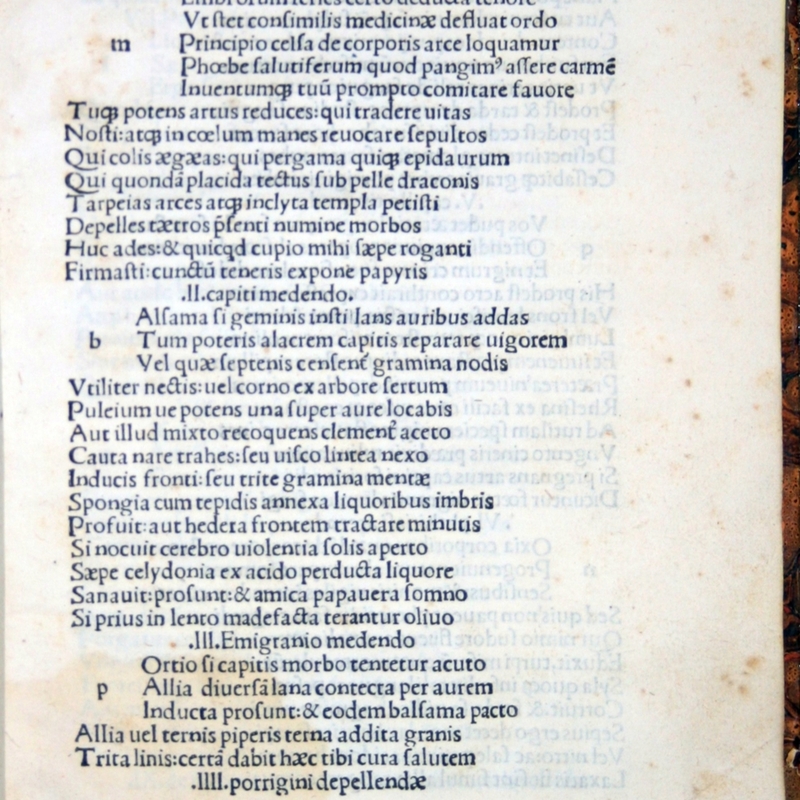 Contains the text of Serenus only, i.e. wanting all before n7; also wanting the final blank leaf p8. Signatures: 4to. a10 b-p8. leaves (1, 58, 121, and 122 blank). Leaf size: 204 x 148 mm. Binding: 209 x 153 mm. 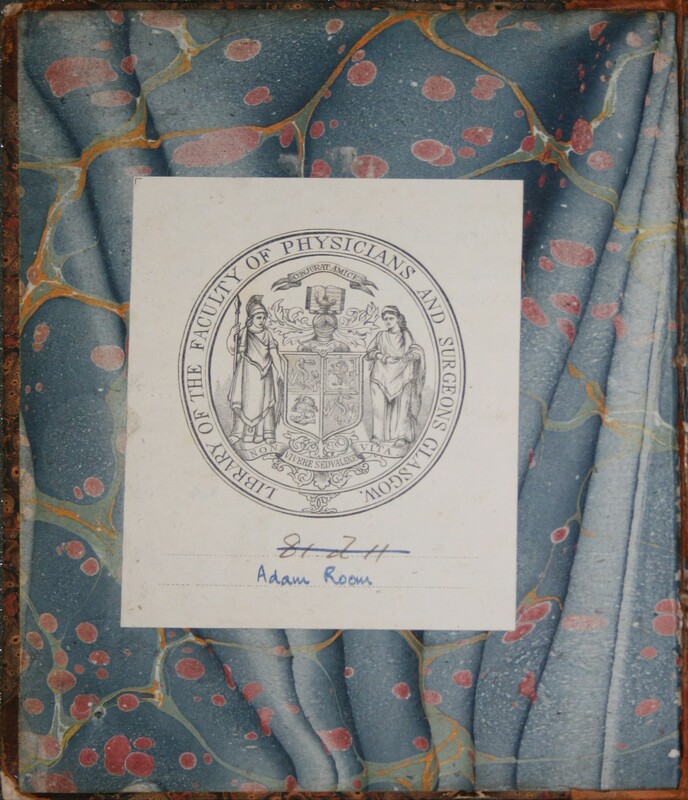 Serenus Sammonicus, Quintus, “Quintus Serenus Sammonicus: Liber medicinalis.,” Heritage, accessed April 23, 2019, https://heritage.rcpsg.ac.uk/items/show/812. Title: Quintus Serenus Sammonicus: Liber medicinalis. 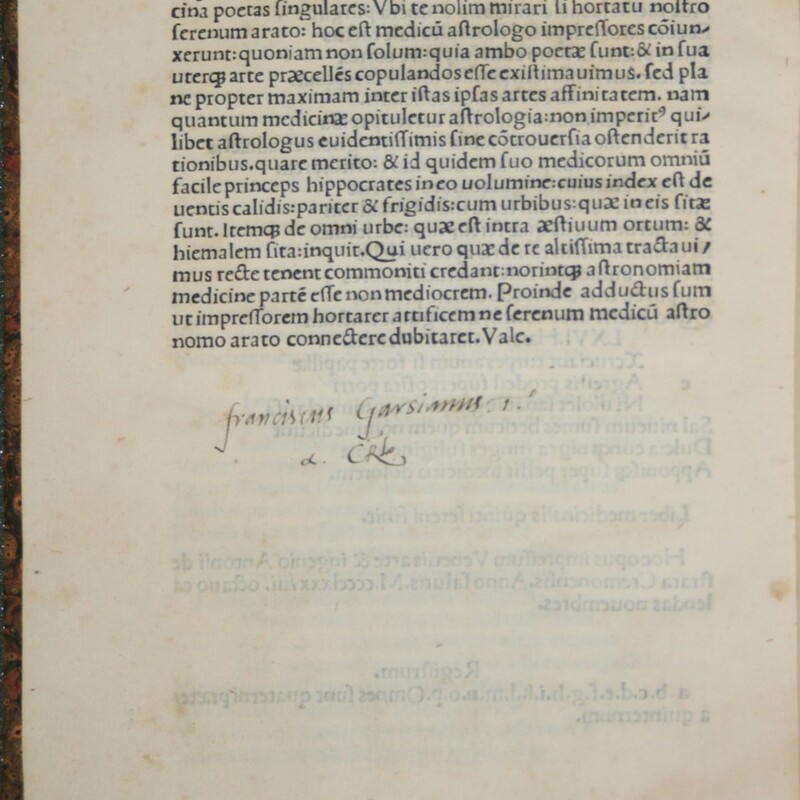 Description: Qvinti Sereni Medicinae Liber. Prohoemivm.